The Korean Peninsula stretches southward from the center of the northeastern coast of Asia, encompassing a land area of approximately 220,000㎢ with some 3,400 islands dotting its coastline. Korea is currently the only nation in the world that is still divided into two different political entities. 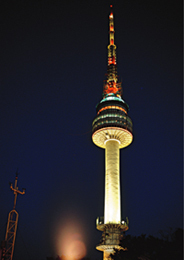 South Korea has a population of 50 million, of which about 10 million live in the capital, Seoul. Over their 5,000-year history, Koreans have achieved an indigenous culture, and their unique cultural properties can be found throughout the peninsula. Koreans have put a high value on education and have earned a reputation for diligence and dedication. The climate in Korea is temperate with four very distinct seasons. Korea has a continental climate characterized by very cold, dry winters and very hot, humid summers. Spring and autumn are relatively short and temperatures are mild and generally quite pleasant. WHCR 2014 is scheduled to take place in spring lasting three months from March to May, which is the most comfortable season to visit Korea. Indeed, it is the ideal season to witness cherry blossoms, forsythia, azaleas, magnolias, and lilacs blooming; in particular, yellow rapeseed flowers in the springtime makes Jeju Island, the venue for our Congress a more magnificent and spectacular place. Hangeul, the Korean alphabet, refers to the series of letters that form syllables with which the Korean language is written. The most unique aspect of Hangeul is that it was intentionally created by the government as a written means of expressing the Korean language. History states that King Sejong, who was Joseon Dynasty's 4thking in the 15 century, sponsored and helped in the scientific creation of the Korean alphabet with the help of a team of scholars, making the most significant invention in Korean history. Hangeul has been designated by UNESCO as an important part of the Memory of the World Heritage. As a result of the Korean Wave and Korea's economic prosperity, the desire to learn Hangeul and the Korean language is exploding worldwide. Korean food is referred to in Korean as Hansik. While many other Asian ethnic foods such as Chinese or Japanese food have become popular throughout the world, Korean food has yet to reach its peak. However, Korean cuisine is becoming increasingly popular among foreigners because it not only tastes good but is healthy. As the people of the world gain a better understanding of Korean food, its flavors, and its roots, Korean food will undoubtedly become a global commodity like the food of Korea's neighbors. The hanbok is also worn for funerals or religious services, and is still used as casual wear in villages or districts where the traditional ways of life are still maintained such as Chunghak-dong on Mt. Jiri. Hanok is the traditional architecture style of Korea. It provides residential conditions with a great harmony between human life and the nature. Accordingly, the natural elements for building Hanok range from inside arrangements to the materials used for the structure. The unique feature of Hanok is the distinct floor plan, which enables to cool inside during summer and to warm inside for winter times naturally. Since summer is hot and winter is very cold in Korea, Korean ancestors built houses with wooden floors for living rooms and heated floors (OnDol) for bedrooms. Because of the high efficiency and comfort, the distinct ancient floor plan is still used for building houses and apartments nowadays. Hanji literally means "the paper of Korea" in Korean. The main material is the fibrous skin of the mulberry. Hanji is not simply paper-it is used in a variety of ways, and has a different name according to its use. If it is glued on a door it is called a window paper; it is copy paper if it is used for a family registry book, the Buddhist sutra or old books, while it becomes drawing paper if four gracious plants or birds are drawn upon it. UNESCO has recognized the unique value and the distinct character of Korean culture by placing a number of Korean treasures on the World Heritage List. Korea has nine cultural heritage sites and one natural heritage site, including Bulguksa Temple and Seokguram Grotto, both in Gyeongju, Gyeongsangbuk-do Province; Haeinsa Temple Janggyeong-panjeon, the Depositories for the Tripitaka Koreana Woodblocks in Gyeongsangnam-do Province; and Jongmyo, the Royal Ancestral Shrine in Seoul.Each and every UNESCO World Heritage site has a cultural value and a beautiful aspect as treasure, so everyone could enjoy them. 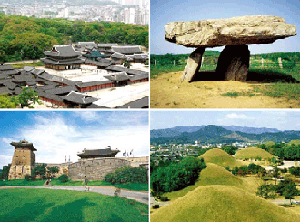 For more information about UNESCO Treasures in Korea, go to www.cha.go.kr. Jeju Island is the premier tourist destination in Korea. Scenic beaches, waterfalls, cliffs, and caves lie in harmony, and the mild weather makes Jeju Island an even more ideal place for visiting. Mt. Hallasan in Jeju has flora and fauna of both temperate and tropical varieties. The Joongmun Tourist Complex provides top-quality accommodations and tourist facilities. 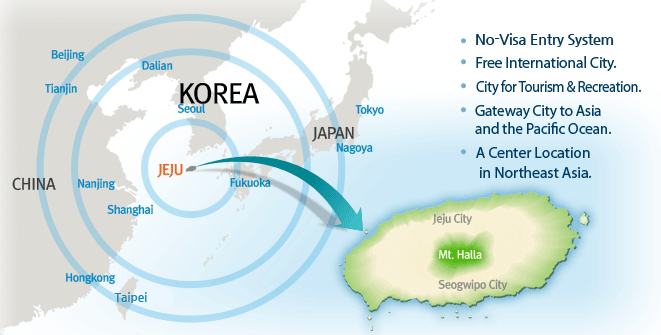 Jeju is located at the center of Northeast Asia, connecting the continent and the Pacific Ocean. Located: In close proximity to major cities of Korea, China and Japan at a central location in Northeast Asia. Climate: Subtropical with distinctive four seasons. Visa: No-visa entry allowed for visitors from 180 countries up to 30 days. Jeju Island, also known as the "Island of the Gods" gifted with nature sceneries and some 1,700 species of plants, is a marvelous island where you can experience unique geographical features nowhere else can offer. The entire island is a natural history museum without a roof. Jeju Island is the only place in the world with three UNESCO certifications: the Biosphere Reserve (2002), UNESCO World Heritage site (2007), and Global Geo PARKs (2010). 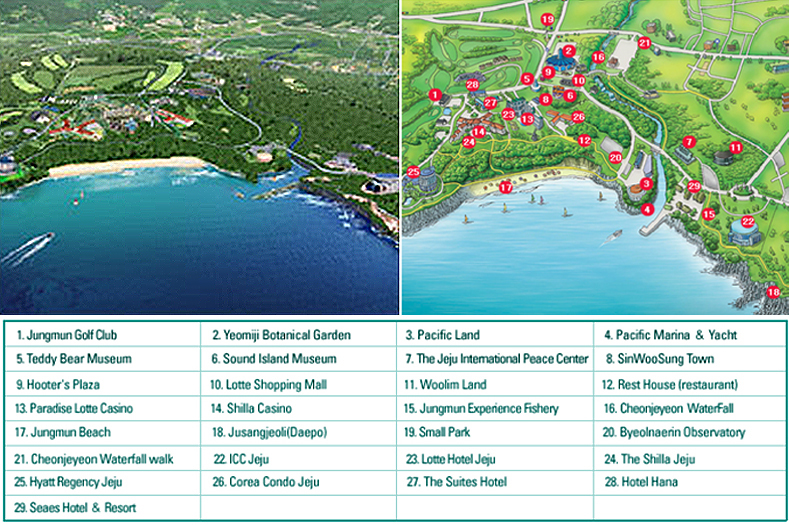 In addition, Jeju has recently been selected as one of the New Seven Wonders of Nature (2011). On Jeju Island, there are a number of places with outstanding natural beauty such as Mt. Halla National Park, six provincial parks, 360 Oreums (satellite cones) and 10 scenic beaches. Jeju also boasts of 132 exciting tourist sites including 50 museums, where you can enjoy leisure and sports activities including mountain climbing, Olle or Oreum trekking, golf, and fishing, as well as explore the exotic culture of the island. Indeed, Jeju Island is a perfect place for families and children to experience the wonders of nature. Since Jeju is abundant in Wind, Stone and Women, it has often been called Samda-do, the nickname given to the island long ago in ancient times. First and foremost, there is plenty of wind everywhere as it is surrounded by water from all sides. Every house has a piled up layer of stones called 'Doldam' which have holes in it to get even fierce winds easily passing through. All these stones in Jeju were formed by Mt. Halla's volcanic eruptions. culture; they have become the primary symbol of the island's traditions and small copies can be found in souvenir shops throughout Jeju. Dolharubang are often erected in pairs near the entrances to counties, cities, villages and even restaurants and were looked at as guardians, religious incantations, as well as location markers. The reason behind a higher number of women compared to men is because the island men used to go into the sea to catch fish and they often got caught out in typhoons, etc. and hence were not able to get back home. 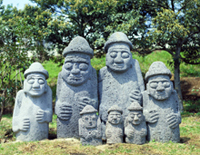 Jeju residents have endured their harsh natural environment and created a distinctive culture. Jeju Island has a unique culture of food, clothing, and housing due to the geographic characteristics of the island and its unusual natural environment. Even today, citizens of Jeju Island maintain this unique, traditional flavor reflecting the island's nature in their houses, tools, and clothing. During your stay on Jeju Island for WCHR 2014, every site you visit will offer you priceless memories you can take home and cherish for the years to come. For more information about Jeju, go to www.ijto.or.kr. Located in the city of Seogwipo on Jeju island, Jungmun resort is blessed with beautiful natural scenery and warm weather. With numerous entertainment facilities, this high-class tourism resort is popular with domestic and foreign travellers throughout all the four seasons. There are numerous sight-seeing destinations within easy reach of the resort, and it is only thirty minutes from Jeju airport. With the spectacular Mt. Hallasan to the north and the deep blue sea to the south, visitors to Jungmun resort will find it difficult to leave. Jungmun resort is the most famous resort in Jeju Island, and it's top quality facilities rank it among the world's best tourism complexes. For more information about the Jungmun Tourist Complex, please click here.